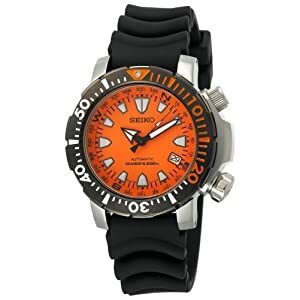 Real divers need a real dive watch. This one is definitely one worthy of consideration. The orange face stands out underwater. The white hands and hour markers help make it easily readable. The tough black urethane strap is comfortable to wear, though it may feel a bit stiff at first. This is an automatic, which uses movement to wind the watch. If it is not used every day it will stop running. However, this may be an advantage if you treat the watch like a piece of dive gear. Normally when you replace the batteries you have to replace the rings and gaskets that keep water out. With this, there are no batteries to replace, so the costs will be lower over the life of the watch.